The mounted rifles participated in a number of major drives that resulted in the destruction of the Boer forces in the western Transvaal. While its tour of operations had not been long, the 2nd Regiment, Canadian Mounted Rifles had proven to be a worthy successor to the units of the first and second contingents. Trooper J.W. 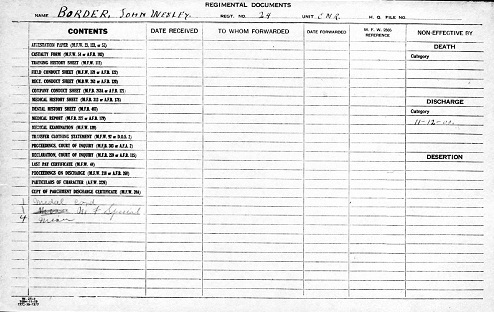 Border (name corrected here) of the Canadian Mounted rifles, who after serving gallantly in South Africa took enteric fever, was invalided and sent home as soon as he was able for the journey. He received a great welcome on Monday evening. He arrived at Campbellville from Toronto on the 5.30 C.P.R. train. A bonfire was burning near the station and there was a large crowd. As soon as Trooper Border, clad in khaki, stepped off the train he was seized and placed in Ex-Warden Hutcheon’s carriage where he was seated beside his mother. A procession of vehicles was then formed, headed by four mounted men carrying torches, who led the way to the farm of the young hero’s father, Richard Border, about five miles north of the village (south of Brookville). Dr. Flatt was voted into the chair and A.J. McLennan read an address and Selby Hutcheon presented Trooper Border with a fine gold watch. The latter expressed his thanks in a short speech, which was followed by addresses from Ex-Warden Menzies, Capt. Beattie, Reeve A. McGibbon, Ex-Reeve Thos. Moore all of Nassagaweya and G.E. McCraney of Milton. There were about 300 people present, but the Border residence is very large and after the conclusion of the speeches all were treated to refreshments. Trooper Border comes of vigorous stock. Among the members of his family who were present was his grandmother, who is in her 105th year. Notwithstanding her great age she is very bright, was as proud of her grandson as any other member of the family and welcomed him as heartily. Corporal Cunningham of the first Canadian Contingent was present in his khaki uniform and was an honored guest. Trooper Border was in the Northwest when the war broke out in South Africa and enlisted at Regina.